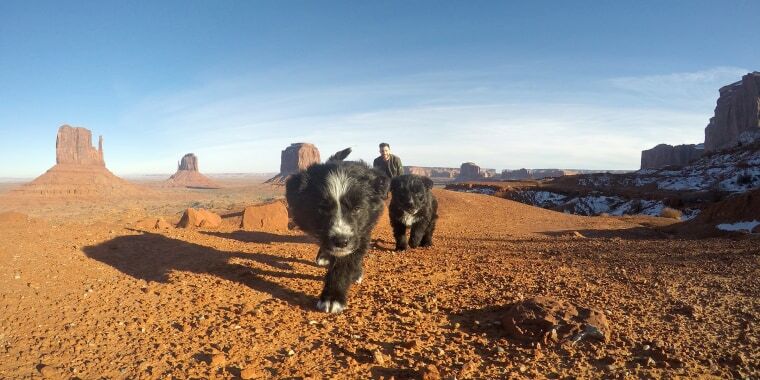 On Dec. 27, 2016, Jordan Kahana was road-tripping through Arizona on his way to the Grand Canyon when he spotted two puppies on the side of the road. Unable to resist, he scooped them up and took them to the nearest veterinarian's office, where they were treated for dehydration. Now, Kahana and the pups, whom he named Zeus and Sedona, travel around the country together full time! Over the last year, the self-described “Adventure Squad” has driven more than 30,000 miles and visited 35 states and parts of Canada. "I'm grateful to be living out my wildest dreams and having my two dogs with me for the adventure," he said. “I quickly switched into dad mode,” said Kahana, who's found joy in everyday moments, like the time he came home and found a pillowcase ripped to shreds with feathers everywhere. "It was too hilarious and they were too proud of themselves to even be mad." Though it's a mystery how the puppies ended up in the desert, Kahana noted the area is known as a hot spot for abandoned pets. Through a DNA test, he determined that Sedona and Zeus are a mix between German shepherd and border collie breeds. When Zeus and Sedona were puppies, the squad mostly went on day trips and hikes around Southern California. But when Kahana, who's still based in Los Angeles, quit his job as a digital director last May in order to travel more, they embarked on a West Coast national park loop that took them through Utah, Yellowstone National Park, Banff National Park in Alberta, Canada, and down the Oregon/California coast. The new arrangement required some adjustments for Kahana, who had grown accustomed to traveling alone. Certain places don’t allow dogs, so road trips that could have been done on a whim before have to be carefully planned out now. Still, "it's great to have companionship," he said. In addition to their many West Coast excursions, the trio has two cross-country trips — Los Angeles to New York City and back, twice — under their belts so far. Unsurprisingly, the Chicago native and his two pups have made more than a few pit stops in the Windy City throughout the past year. These days, Kahana supports himself by freelancing, and keeps his travel costs down by crashing with friends whenever he can. He documents everywhere the Adventure Squad goes with “pupdates” on Instagram and Youtube, and hopes to add more international destinations to the group's itinerary soon. Despite the nonstop adventure, the unexpected adoption of the puppies stands out in Kahana's mind. "It's super rewarding," he said, "and probably my favorite thing going for me right now."